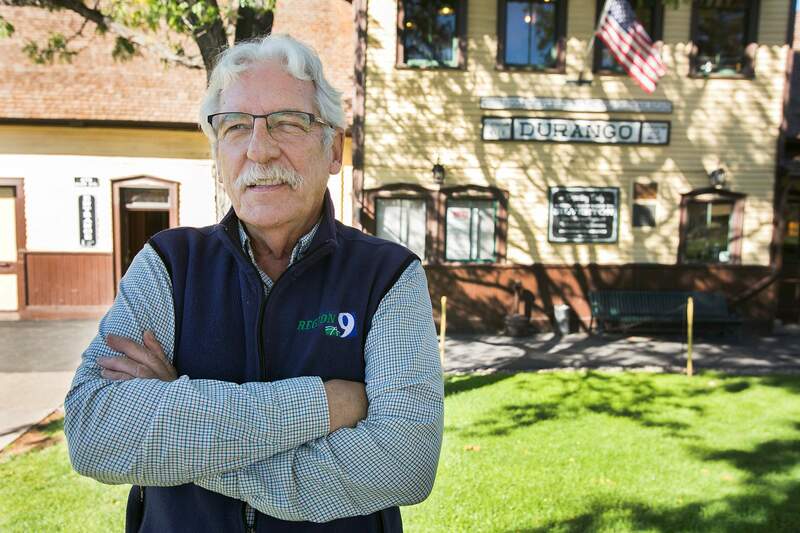 As Executive Director of the Region 9 Economic Development District, Ed Morlan helped provide a loan for the Durango & Silverton Narrow Guage Railroad to help it cover its payroll after the Missionary Ridge Fire in 2002 hit local tourism. Under Morlan, Region 9 also worked with Sunnyside Farms Market and Terry’s Ace Hardware, among many others. 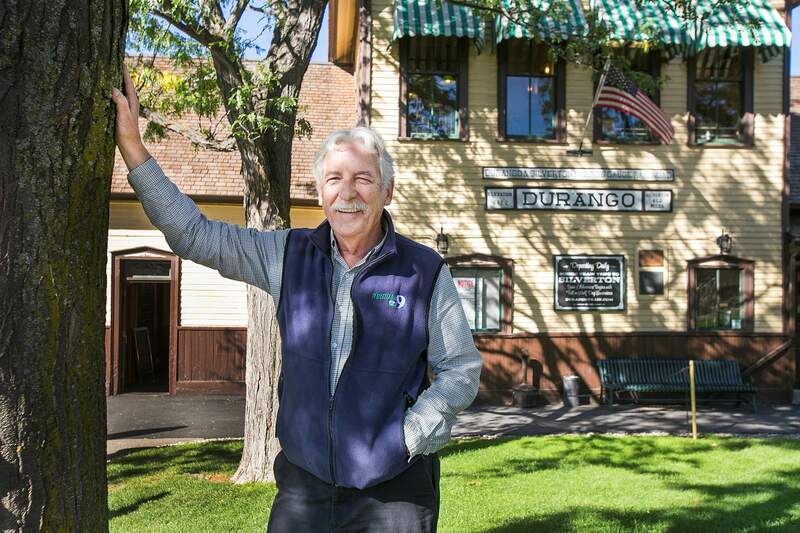 Ed Morlan of the Region 9 Economic Development District pauses outside of the Durango & Silverton Narrow Gauge Railroad depot Monday. Silverton Mountain, Mercury Payment Systems, Zuke’s Pet Treats and Steamworks Brewing Co. are just a few of the businesses the Region 9 Economic Development District of Southwest Colorado has helped while Ed Morlan was at the helm. After 27 years and $22 million in loans, Morlan is retiring from his position as executive director at the end of September. The economic development district is a nonprofit public-private partnership that helps spur job creation within its five-county region by providing loans to startups that do not qualify for bank loans. For years, Morlan also oversaw regional transportation and telecommunications infrastructure planning. In recognition of his work in economic development regionally and across the state, Gov. John Hickenlooper declared last July 28 to be Ed Morlan Day. “Ed brought professionalism to the job, and his efforts have helped to impact the lives of many,” the official proclamation read. Others also praised Morlan’s work with the district. His deputy director, Laura Lewis Marchino, said Morlan was willing to try new things, which allowed him to find options and opportunities that others didn’t see. She said he was also willing to work for extended periods to accomplish a project. “He is not intimidated by a two- or three-year window, and thus, he gets it done when others have lost interest or the political environment has shifted around what is important,” she said. Marchino will replace Morlan in October. In addition to his work leading the economic development district, Hickenlooper recognized Morlan for serving five terms as a Bayfield Town Board member, helping start an entrepreneurial accelerator and working on state boards. While Morlan has seen success in economic development, his original career plan was to teach. After growing up in Houston, he was drafted into the Army in 1969 and spent two years in Vietnam as a combat medic and earned a Purple Heart and Silver Star. When he left the service, he went to college in Gunnison to get his teaching degree. In his first year as a long-term substitute teacher in a fifth-grade class, one student – a troublemaker – changed his life. “After a year of that, I thought ‘This isn’t what I want to do,’” he said. So he went to work at a bank in Ignacio and learned the basics of finance. He went on to work for the city of Durango in 1980 and 1981, managing a loan program to spur revitalization and handicapped accessibility. He also worked with the Southern Ute Indian Tribe as the economic development director. These positions helped prepare him for the job at Region 9. When he was hired, the district was more than $30,000 in debt because of mismanagement. To become functional again, the governments with the five-county region had to pay off the debt. While the area has had economic challenges since the Great Recession, Durango survived the downturn better than other communities, in part because of leadership in the community, he said. “If you don’t have leadership, nothing gets done,” he said. Region 9’s goal is to help communities plan for development and create an environment for growth. For example, Morlan helped develop the Growth Company Initiative about seven years ago to bring businesses with great potential together to expedite their expansion. This helped lead to the founding of his brain-child, the Southwest Colorado Accelerator Program for Entrepreneurs. Since 2013, it has helped 10 startups with mentoring and seed funding. Leaving Region 9 is bittersweet, Morlan said, but he plans to stay involved in economic development as a consultant for the new venture capital program that First Southwest Bank is setting up. He said the program will be managed by a separate firm and should be ready to accept applications next year.